Respect. Honor. Reverence. Admiration–these words are often used to describe people, in our lives, afar, or in history that we hold in high regard. But these same words can also be used to describe many druids’ feelings towards the living earth–plants, animals, oceans, rivers, forests, trees, natural wonders, insects, mycelium–the soil web of all life. The world is a wonderous, incredible place, and those of us who follow a path of nature-based and nature-rooted spirituality recognize this. Reverence is having deep resepect for something, treating it with value and worth. 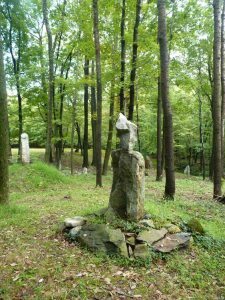 Those of us who are drawn to druidry and nature-based spirituality inherently have reverence to the living earth–it is part of what sets us on this path and encourages us in this direction. 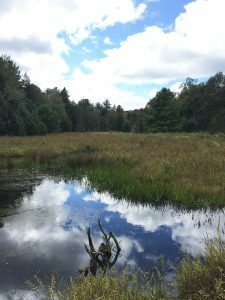 But as we deepen our spiritual connection with nature, I believe that our reverence also deepens over time. Current statistics from the United States EPA suggest that Americans spend almost not amount of time outside: the average American now spends 93% of their total time enclosed (including 87% of their lives indoors and 6% enclosed in automobiles). A UK-based survey indicated that children now spend less than 30 minutes or less outside and 20% of children don’t spend any time outdoors on an average day (which is less time than prisoners spend outside per day). I think that the reason that a lot of people find druidry is because of statistics like these: increasing work and life demands make it harder to get outside, increased urban sprawl makes it harder to find “wild spaces”, and our relationship with nature is at a deficit that has implications for our health, happiness, and well being. Lepa Mara means beautiful woman when she wakes up in March when the thunder god Perun, her father and the lightning goddess Perunika, her mother makes their first thunder and lightning together to open heaven’s gates in Spring for their daughter Mara. Mara and her Mother Perunika are symbols of feminine rebirth and resurrection of nature from its winter sleep into spring. In the homes of the ancient Slavs there were small altars in the corner of the house with wax, amber or wooden figurines where girls and women used to offer sacrifices like flowers, ribbons, embroidered napkins, etc. A fire burns or candles here that could be put out only using your fingers, otherwise the peace of the house would be put out with it. Living magically is the state of living mentally active rather than passive. It is knowing what goes into our subconscious rather letting someone plant ideas in our head. It is the ability to look at the world through fresh eyes. It is being consciously aware of all our actions, goals and interests. It is the willingness to confront our perceptions and be willing to change if needed. It is expanding your awareness and understanding both internal and external worlds. It is the commitment to seek and see with our own eyes and mind. To know the difference between real and unreal, truth and untruths. Understanding the reality you live in is very real. 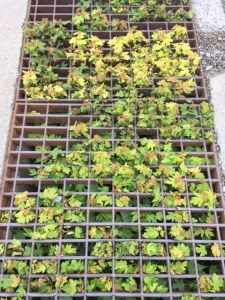 Maples growing up through grate–been there for years! A Bindi is a bright red dot worn on the forehead by people who follow Hinduism, Buddhism and Jainism. Lately it has become a fashion statement in Hollywood. It is said to represent the third eye or the 6th chakra. This is not a symbol of a married woman, it has more to do with spiritualism and meditation. Where did this red dot come from? The picture of Alexander the Great should give it away.